How does it look? 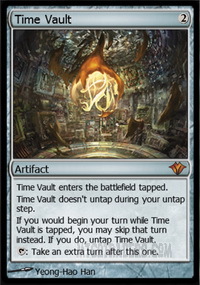 Anything else that, going by the same logic we used for Legacy, should be banned? 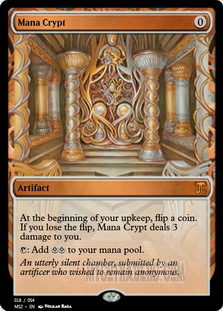 I figured Mana Vault and Mana Crypt are okay, they're fast mana with built-in downsides, and we must include a few power cards more compared to Legacy, otherwise it's pointless. Serpent came of age! Who would have thought! Of all the Unhallowed Tribes (still the majority: 114 out of 196), the dorky marine monstrosities sure weren't high in the list of those who were closer to achieve their first event win. It's all thanks to TLR... and Living End . Turns out there's quite a few cyclers in the tribe. By the way, the Serpents are not "serpents" as in the synonym of "snake": they're "sea serpents", but creature types can't be expressed witty non-hyphenated double words, otherwise you'd create two different subtypes at once. And "Sea-Serpent" looked too clumsy, I guess. Moving on, Kavu already had its event win, but it happened so many years ago (on the very first season of the Blippian Era, event 26) that it would have been extremely noteworthy as well. And Yokai_ came awfully close with this list. I take the name of the deck to mean Yokai_ won't be able to play again this year, but thanks to this result and last week's he's currently back to be the seasonal leader, if only 4 points ahead of Nagarjuna. It was a Rat-infested event, though. Four Rat lists showed up, and they all entangled with one another on round 2, creating our version of the ominous rat king. The dominant rodent was Generalissimo, with a list of which we have video evidence and a commentary below. Both Generalissimo and I lost only to the Serpents, and I was playing my event-winning Plant builds, which I'll also discuss below. Here's Generalissimo's Rat Adventure in all its filthy details. GENERALISSIMO: My deck was an experiment in using (Rat Colony) to address an issue I've long had with Rat decks: namely, that they were great at dismantling the opponent's starting hand with discard but then often lacked the punch to end the game before the opponent had an opportunity to draw into something. 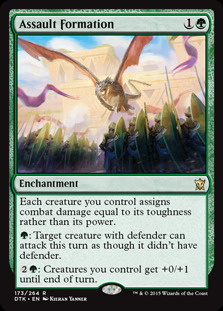 Previously, I found games would often devolve into fighting a long top-deck battle using a deck full of cards that only function when the opponent had something in hand while trying to chip away with 1/1s and 2/1s, which always felt pretty terrible, but the Colonies provide a much quicker avenue to victory. KUMAGORO: Well said. I never really got why Rat is so popular. It must be one of the tribes with the lowest "win:played" ratio (that could actually be an interesting statistics to compile). 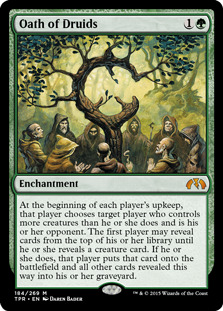 GENERALISSIMO: Well, I think it's a fun tribe with a bunch of powerful members but the optimal way of putting them together is not at all obvious, which makes for an interesting deck-building puzzle. I obviously can't speak for anyone else's motivations, but that's why they appeal to me. KUMAGORO: Yeah, I mean, they seem popular with Spikes. I think right now it's Berserker, then Rat in Underdog events. And with Berserker, the Spike appeal seems a lot more obvious. 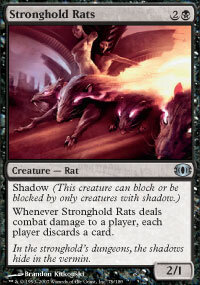 Anyway, yours was a Rat Colony deck, then. 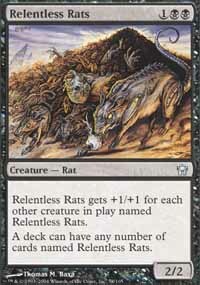 I didn't even realize Rat Colony wasn't just another Relentless Rats , but an improved one that mixes well with other Rats. I guess getting the number of Rat Colonies right is not a simple matter. 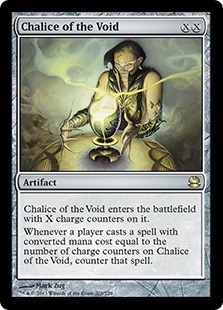 What if the deck went in a different direction than disruption, though? 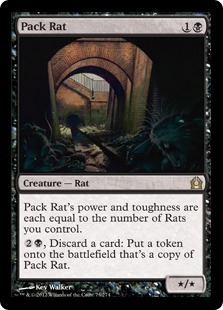 I mean, it's good with it, but not all monoblack decks pack 9 pieces of hand disruption, and the previous synergy with the Rats' own disruption is gone in this particular build of yours, so it feels somehow vestigial. 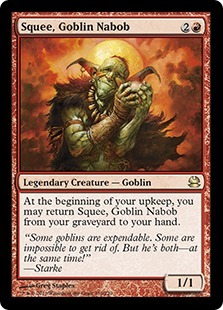 Not sure what to suggest in its place, maybe something that values self-discard to interact with Pack Rat , like madness cards or Squee, Goblin Nabob . 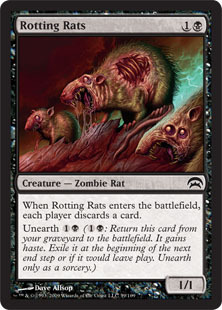 GENERALISSIMO: There's definitely a self-discard-focused deck you could make with Pack Rat, Rotting Rats and Stronghold Rats but the point of the Colony deck was to push the tribe to be more aggressive, so adding something like Squee or madness cards to generate slow value from Pack Rat doesn't make sense to me. The disruption suite is pretty important because, while they're powerful, the Colonies are also extremely fragile and have no evasion, so there's a good chance they won't be able to beat an opponent who's free to execute their own plans. 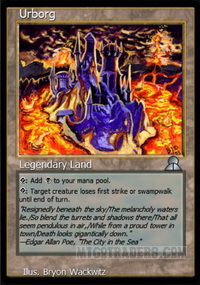 KUMAGORO: It also seems like a deck with basically 99% of the cards at CMC 1 or 2 could afford to go lower than 22 lands. 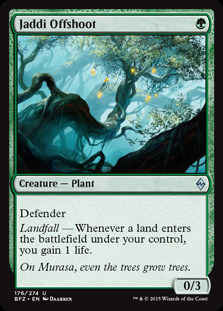 GENERALISSIMO: It does seem like it, but you very often don't want to use Swarmyard for mana and Pack Rat provides an out to flood, so testing 21 lands might be worthwhile but I wouldn't want to go lower than that. KUMAGORO: In the last match your attempts at surviving in the face of inevitability were agonizing, it was like... watching a rat trying to escape a maze! GENERALISSIMO: Really? I found that match particularly thrilling to play; trying to squeeze out every possible advantage to overcome a bad position can be a lot of fun. Besides, rats are great at running mazes! KUMAGORO: I meant all the thinking over blocking after the Living End happened, when it seemed safe to say you had no way out, at best only a way to prolong the game one turn or two further. But hey, I'm not saying you shouldn't have thought that out fully, it's actually a good exercise for both you as a pilot and the watchers. But I think you just have to accept that it was a very bad matchup. 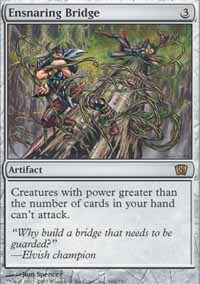 Fast combo in general is like that for most decks that lack some natural antidote by happenstance. 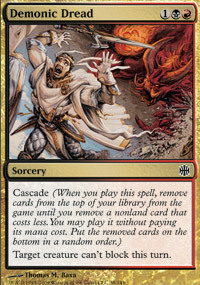 GENERALISSIMO: I'm not sure I agree it was bad matchup; I had the capacity to strip cascade cards out of his hand, a reasonably fast clock and the ability to stock my own graveyard with Pack Rat. I mean, I don't think it was a good matchup or anything but it didn't seem bad. KUMAGORO: Too chance-based. 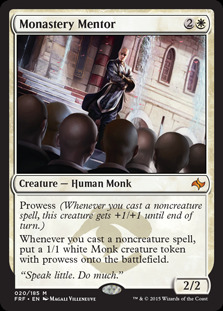 You didn't have a consistent ability to prevent him to go off on turn 3 (he just needed to draw into one of his cascade spells after you disrupted his hand – and he had lots of ways to draw more than one card per turn), and at that point you wouldn't have anything meaningful in the graveyard. 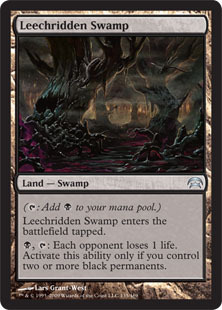 And in general, post-Living End, he'd have 5/5s and swampwalkers to throw at you, you could hardly put up sufficient defenses against those. GENERALISSIMO: I just realised that old-school Urborg would have been useful for my deck in this event as I faced both first strike (in CruelHellraiser's Pilot deck) and swampwalk, and they were both a problem. 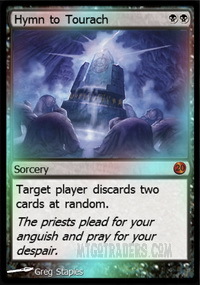 KUMAGORO: By the way, you might not have been correct to cast the first Hymn to Tourach against TLR's Serpent deck, but I think you were correct casting the second one. 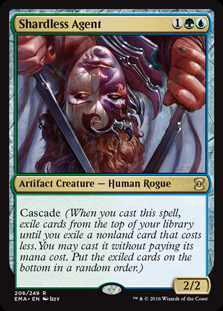 I'm pretty sure he wasn't just protecting a cycler, he was protecting the cascade enabler. And after countering the first Hymn, he had four cards left in hand, so the second one had a 50% chance of hitting the cascade guy, which meant great chances for you of winning from there. You just lost that flip, but I'm convinced it was the correct play. GENERALISSIMO: I keep going back and forth about that Hymn. 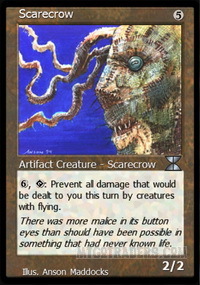 It may have be a 50% chance to hit the cascade card and basically auto-win but that's still 50% chance to hit other creatures and seriously damage my capacity to fight through a Living End, which with two Pack Rats in the graveyard and a Leechridden Swamp in play seemed like a real possibility. 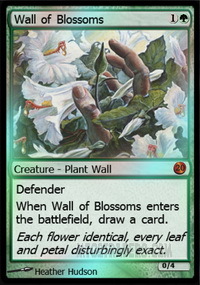 KUMAGORO: As for my deck, I just rehashed the only deck that won me an event this year, my Assault Formation /(Arcades, the Strategist) Plant defender ramp. 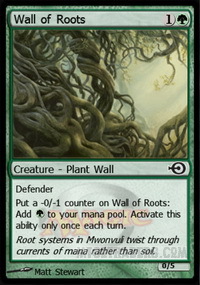 The team is the same and essentially solved, ramp via Wall of Roots and Sylvan Caryatid with the help of Overgrown Battlement (which is still not a Plant, alas) and Gaea's Cradle ; Wall of Blossoms as cantrip; Tree of Redemption as main finisher; and Jaddi Offshoot to complete the ranks (it's definitely the lesser Plant here but it's not bad, gives me something to do on turn 1, stands the ground, later becomes another attacker and gets me some life in the meantime). I just fixed the mana base to include some blue sources for Arcades (which I had forgotten last time! 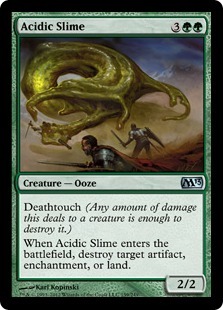 ), and tweaked the Green Sun's Zenith toolbox by adding a second Arcades in place of Eternal Witness – actually, I wanted to take out Acidic Slime instead, but then forgot to make the change; not sure which is the more correct, regrowing one of the enablers might be important. 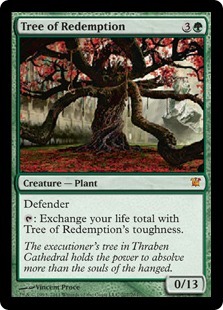 I also removed the mostly cosmetic Nissa, Voice of Zendikar for a second Vivien Reid, since I'm not yet selling the two copies I bought for cheap early on in this Standard rotation, so I might as well use them; she helps finding Arcades and it's easy to get her to ultimate from behind the Plant cover. 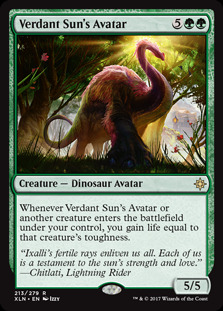 GENERALISSIMO: How useful has Verdant Sun's Avatar been in your deck? Just looking at the list, that's the thing I would lean towards cutting for the second Arcades rather than the Witness or the Slime; it just seems like a lot to pay for lifegain in a deck that already appears well equipped to beat aggressive decks. KUMAGORO: It would seem like that, yet the big Dinosaur is almost constantly my first Zenith if I have Arcades in hand, and it always earned its place in the 60. It guarantees that if I don't draw into Assault Formation early on (that's the stronger path to victory, as I'll explain in a moment), which I don't have any way to fetch otherwise, I'll last long enough against any kind of aggression (burn, flyers) to draw into a Formation or ultimate Vivien while still having some non-defender to attack with. Now, Arcades is great, if I manage to keep Arcades alive for a couple of turns it's good game, but he's often dealt with, as all the opponent's removal will inevitably be directed at him. 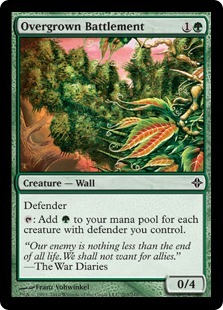 There's really nothing in the deck you want removed except for Overgrown Battlement, but come game 2 you'll also realize I don't particularly aim to cast enormous spells, and I actually hope the Battlement works as a removal rod so Arcades might be safer. Assault Formation is just more resilient, even if it lacks the be-all and end-all of Arcades – and his added flying damage as well. 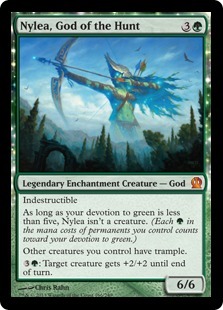 I found myself fetching Nylea, God of the Hunt less frequently this time, but of course if I end up stuck in a ground roadblock, I'll need her. 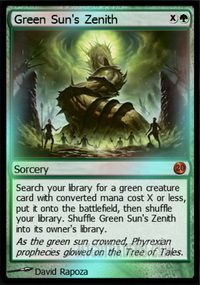 Besides Arcades, which just acts as a tribal lord, Verdant Sun's Avatar and Nylea are the only two off-tribe Zenith targets related to the tribe's plan (respectively exploiting the large toughness of the Plants and providing evasion when all that toughness turns into raw power). Any other possible target, which includes the Witness and the Slime, would be a pure silver bullet. And I think the Slime in the end might be the safer choice, giving me a way out of Moat or Ensnaring Bridge and such. 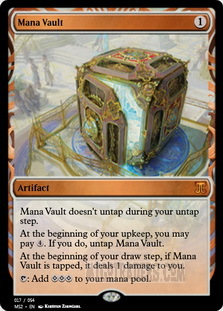 While recurring Arcades via Eternal Witness might prove pointless if I can just Zenith another Arcades instead, for less total mana. I assuredly won two matches out of three, but, like you, I couldn't stop TLR's Living End deck: I was close to lethal both games, but he comboed off on turn 3 every time, and that's too fast. 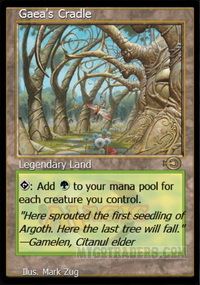 Is Living End in Legacy with Shardless Agent a concern? 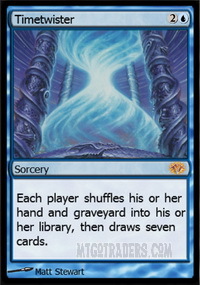 I mean, he seemed unstoppable this event, but had 8 cascade enablers as usual (only, Shardless Agent is more efficient than Demonic Dread ), the math is the same as the Modern version. GENERALISSIMO: I don't think Living End is concerning. 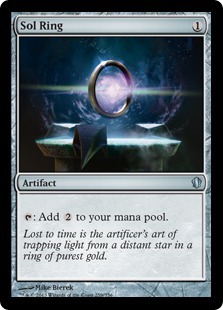 The earliest it can End is turn 3, and even then it takes at least another turn to win, maybe two, depending on what creatures the pilot was able to get into the graveyard, and there are plenty of avenues for it to lose; graveyard-hate, obviously, but also countermagic and board sweepers, red aggro can burn it out post-End and other combo decks can outrace it, since there's a pretty hard limit on how much interaction a Living End deck can play with. KUMAGORO: Technical curiosity: do you record your deck tech before or after the event? GENERALISSIMO: Before, assuming I don't, for example, wake up from a nap 10 minutes before the start of the event without having figured out what deck I'm going to play.